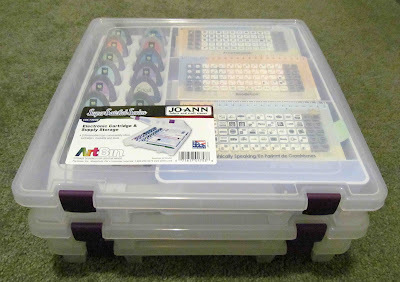 When I learned that ArtBin was coming up with a storage solution for Cricut cartridges, I was very interested. Before, my cartridges were in their respective boxes which were in a book shelf in a separate room. The booklets are in my craft room so I can easily grab them when I need to flip through pages. So when I found out that Joann's was going to carry the ArtBin Electronic Cartridge and Supply Storage, I checked it out as soon as I had the chance. Armed with coupons, I found them on Sunday and decided to get three. In the ArtBin website, they have the colors GREEN and CLEAR w/ GREEN LOCKS. The one I bought from Joann's is CLEAR w/ PURPLE LOCKS. One satchel can hold up to 16 cartridges. Then there's a separate compartment with three bins for the keypads and booklets. There's also another thinner compartment where you can put Cricut tools. My favorite part here is that 16 cartridges, keypads and booklets can be all together in one case. It saves way lot more space than keeping them in their own boxes. With the three stachels I bought, I still have 5 vacant slots for future cartridges. I hope I won't have to fill that up soon. This is definitely a good buy for me. 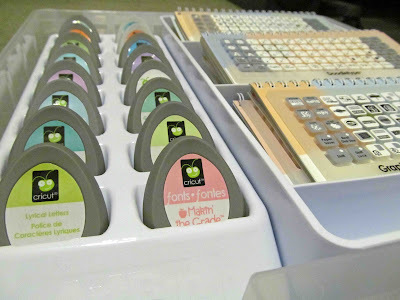 I finally found the best storage for my Cricut cartridges. It sure looks like a great solution for storing these. It´s always been aproblem to find the quite right way. I´ve tryed more different ways, but none of them has ever worked really good anyway, so they always ends back in their own boxes again. Will have to check this out a bit more, and will look forward to hear, what youre going to think of these after a little more time.